When I was 14 or so my brother Mike came home from the Navy. He had with him a guitar and a record on how to play it – Pete Seeger’s “Folksinger’s Guitar Guide.” He soon was caught in college and left the guitar and record at the house. I was intrigued with the sound of the guitar on that recording and learning to play. Looking in the phone book for the closest music store that featured guitar lessons I located Mike Richey’s Guitar Center. It was located in one side of a very small duplex not but a few blocks from my home. I walked there with the $40 Kay guitar I had bought on time at a television repair shop that was owned by a friend of my dad’s. There I began a life-long friendship with Mike Richey (now known as Slim Richey) and my life in music in general. Slim was and still is a very fine jazz guitarist but is also a fan of many styles of music including bluegrass – my specialty. My life quickly became all about music and hanging around musicians. I am, as of this writing, 61 years old, so for the last 46 years I have been involved in music and made my living from music as a touring performer, recording artist, workshop/seminar presenter, music camp director, and a college professor. Slim moved away from Norman, Oklahoma and surfaced again in Ft. Worth, Texas with a mail-order business of musical supplies specializing in stringed instruments and accessories – Warehouse Music Sales. 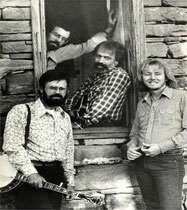 With the rise in popularity of bluegrass and his connection with me, he began a recording label. 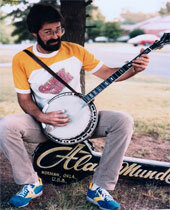 My first solo album, “Banjo Sandwich,” was on Slim’s Ridge Runner label. Also my first tab book, my solos from “Banjo Sandwich,” was published through Slim. Together we produced many fine recordings and instructional material of mine. He also produced recordings of many other great artists. The upshot of all this is that through Slim’s influence first as a musician and second as a business operator, I too am getting into the mail order business. Al Munde’s Banjo College is a more specific in that the only products I sell are my recordings or instructional material. I have enjoyed my life-long participation in good music making and hope you enjoy the results of my endeavors.